Charity Cycle. 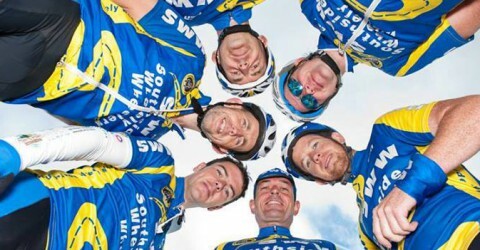 Cycling for charity is very important to Southside Wheely Wheelers cycling club. We suffer on our bikes so others don’t have to. Our club chairman Sean Burchill and his son Cian are going to do 350k charity cycle in aid of Fighting Blindness by cycling around Tuscany Valley in Italy starting 30th April to 7th May 2011. Ryan’s Super Valu Kilmallock have generously allowed Sean and Cian hold a bag packing weekend on Friday 11th and Saturday 12th February to help raise much needed funding for the charity. Club cyclists and anyone wanting to help with the bag packing, please ring Sean on 0871466524. Southside Wheely Wheelers wish Sean and Cian the best of luck on the charity cycle. Our cycling club is proud of our cyclists who help others though their cycling. 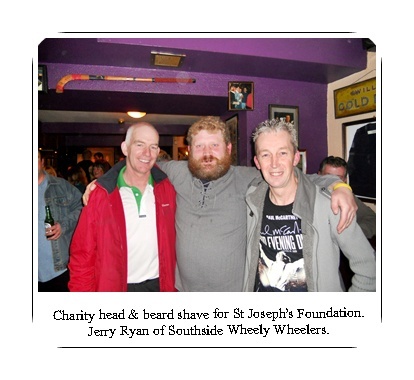 Our first Social night out was in Mike Houlihan’s Bar to support a charity event as club member Jerry Ryan (Talk to the Hand) had his head and beard shaved for charity St Joseph’s Foundation on Saturday 13th November. Jerry raised over €3000 Southside Wheely Wheelers supported Jerry on the night and next morning with some sore heads our Sunday morning cycle was dedicated to Jerry and the charity St Joseph‘s Foundation and club cyclists made a collection for Jerry’s Charity. The 3rd annual Cliona Ring sponsored cycle will take place on Saturday 6th November leaving the Honey Fitz theatre at 10am. This year the foundation is honoured to have Sean Kelly, cyclist, lead the charity fundraising cycle and a large turnout is expected on the day. “We wanted to get a celebrity to be involved with the cycle and we were so thrilled when Sean Kelly agreed to take part,” said Brendan Ring. “Sean believes that the charity is extremely worthwhile and said that he was delighted to be asked to take part in such an event,” he continued. The cycle covers a course of approximately 100km and begins at the Honey Fitz theatre in Lough Gur. It then travels through Bruff, Knockainey, Hospital, Herbertstown, Caherconlish and into Limerick via the Ballysimon road. The cyclists will return to Lough Gur via Ballyneety, Grange and Holycross. Tom Tierney, one of the organisers who is also attempting to cycle for the first time added that “there will be a number of bucket collectors along the route asking for donations for this worthy cause. Members of Knockainey soccer club will be collecting so please be generous!” After the event there will be a very welcome cup of tea and some refreshments at the Honey Fitz for all the cyclists and helpers. It isn’t just locals though who are taking part – members of Southside Wheely Wheelers Kilmallock, Limerick Cyclists, and other cycling clubs also take part as they recognise that although the cycle is about raising money for this very worthwhile charity it is about doing it in a way which is filled with laughter and fun amongst friends and neighbours – all of which were key elements to Cliona’s life. 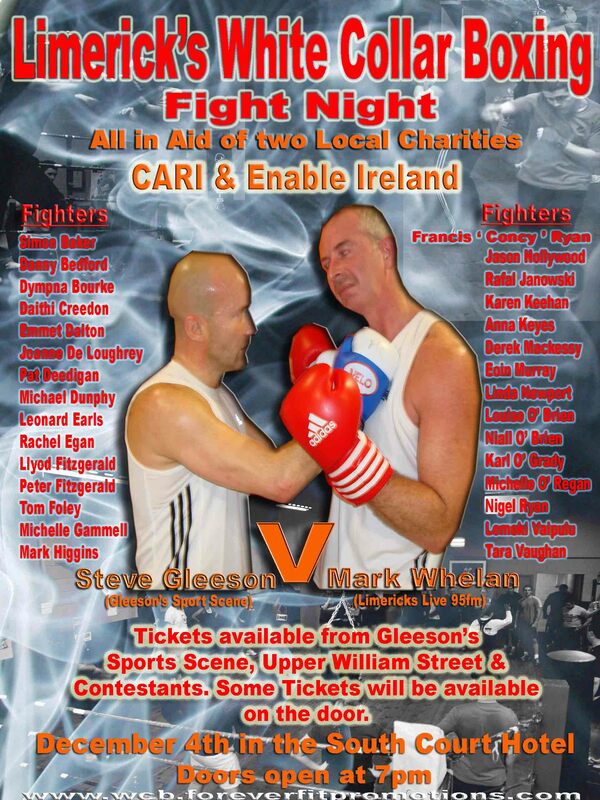 The foundation is named after Cliona from Lough Gur and Bruff who lost her very bravely fought battle against illness in December 2006. After being diagnosed with an inoperable brain tumour in 1998 her parents, Brendan and Terry discovered that in addition to the emotional drain on families in their situation, even families with good medical coverage find that lodging, food and other “hidden” non medical expenses can prove quite a hardship during an already traumatic time and it is to fund these “hidden costs” that the foundation was established in 2007 to provide financial assistance to families from Ireland who have children undergoing long-term medical treatment for serious illness. Cliona was a wonderfully warm person who faced her illness and its treatment with courage and good humour and was an inspiration to all. Her family decided that her gifts of inspiring and helping others should continue and this motivated them to establish the foundation in 2007 with the help of friends and neighbours.